The Pilgrim Story is considered by many to be the United States of America’s founding story. The dramatic story of perseverance and courage, the dangerous voyage, the landing in 1620, the first fearful winter, the first Thanksgiving at Plymouth Rock, has all inspired many Americans throughout the history of the nation. The story of the pilgrims has been represented in many major historical paintings, such as the heroic Landing of the Pilgrims by Henry Sargent and the First Thanksgiving by Jennie Brownscombe. The actual story that serves as an inspiration for these painting is a far more heroic tale. 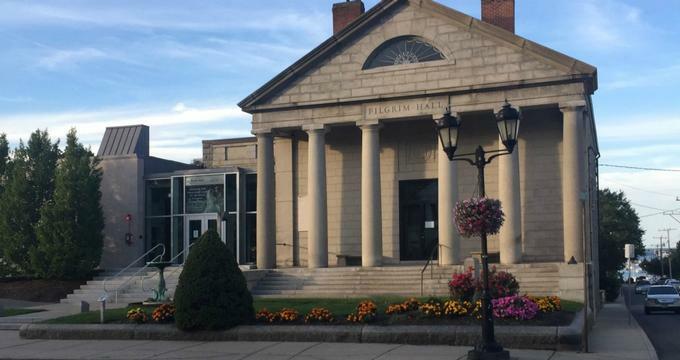 Located in the heart of historic Plymouth in the state of Massachusetts, the Pilgrim Hall Museum shares this amazing story with visitors of all ages, locals and tourists alike. The Pilgrim Hall Museum is the older public museum operating continuously in the United States. The museum is home to an unparalleled collection of objects once owned by the Pilgrims. These artifact tell the tale of determined and brave men and women who built homes and lives for themselves and their families in a new, unknown world. Among these various Pilgrim possessions are the Bible owned by William Bradford, William Brewster’s great chair, the sword used by Myles Standish, and the cradle of Peregrine White, the first Pilgrim child born in New England. The museums also features the a portrait of Edward Winslow, the only portrait of a Pilgrim that was painted from life, and an embroidery made by the daughter of Myles Standish, the earliest sample created in America. At the Pilgrim Hall Museum, visitors have the opportunity to learn about the Wampanoag, or “People of the Dawn.” This Native American tribe are the people who had inhabited the area for around ten thousand years before the settlers from Europe arrived and are still reside in the area today. The interesting tale of the interrelationship between the European settlers and the Wampanoag continues up through the horrible conflict, known as King Philip’s War, that took place in the 1670’s. Visitors are invited to come to the museum to learn and explore the history behind this story. Displaying a collection of various Pilgrim and Native American artifact, the Pilgrim Hall Museum is a gallery-type museum that shares the story of the traditions and founding of America. The museum features two different types of exhibits: changing exhibitions and permanent exhibits. The permanent displays at the museum combine historical information and artifact from the museum’s collections to highlight the Native American and Pilgrim story to the year 1692, the year in which the Plymouth Colony came to its end. These permanent exhibits offer visitors a great way to learn more about the history of the Pilgrims. Visitors can view a variety of possessions of the Pilgrims at the Pilgrim Hall Museum that came to America aboard the Mayflower. Guest can watch a short film as an introduction to the museum, as well as view temporary, changing exhibitions on different topics. These changing exhibits are often created around a particular collection segment or a specific Pilgrim-based theme.